Besides the moon, the ladybug is another favorite photographic subject! 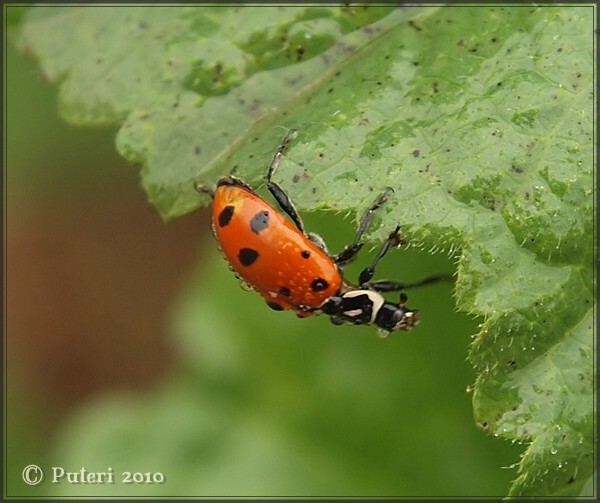 Regular readers to my blogs will surely have noticed the number of times I have shared pictures of the ladybugs I'd taken. 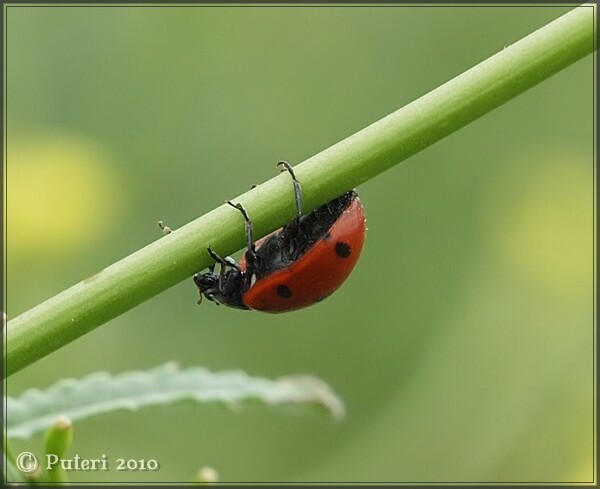 In the past I have seen several beautiful pictures of ladybugs taken by other people and that is how I came to love photographing them. They look so beautiful among the green plants, and there is always that satisfaction when the pictures you'd taken of them turn out spectacular! Doug's colleague has even asked him to ask me if I'd be willing to sell prints of the ladybugs to her. Er, maybe. 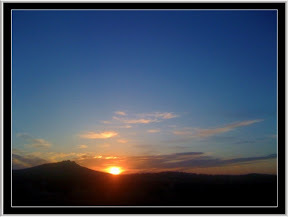 I still have doubts about my photographic skills! 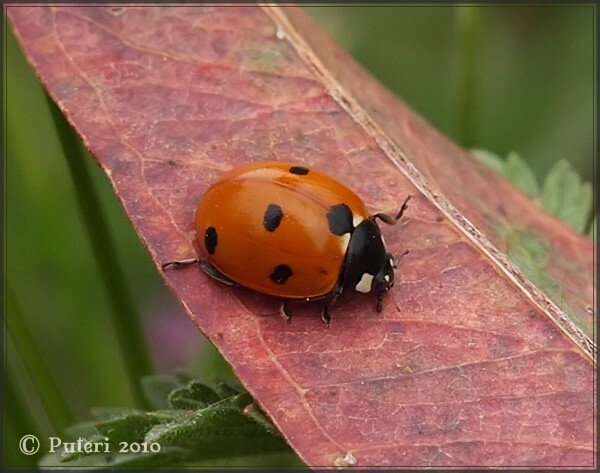 I remember how beautiful the ladybugs looked with dew drops on their wings in the early autumn mornings. It is late spring now and the weather is very dry at this time of the year, and the only way I can capture that image of dew drops on the ladybugs is to spray them with water! So here is a picture of a ladybug with water droplets on its glossy wings! Last night I took another picture of the moon. 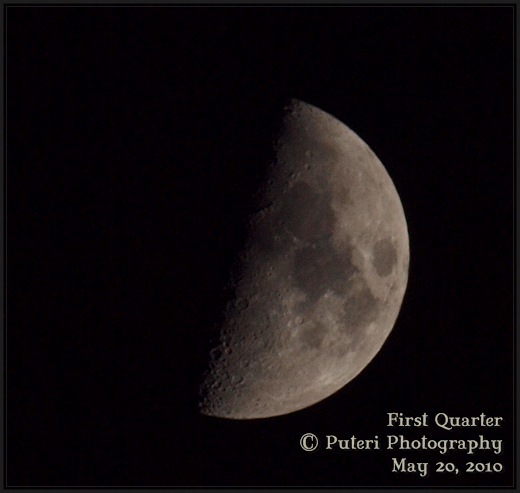 This time the moon has moved from the waxing crescent phase to first quarter moon phase. My cousin thinks both she and I have moon fever! We can't seem to stop photographing the moon! She doesn't have a dSLR camera but with her point and shoot she could still take an interesting daylight shot of a plane passing the moon. It was a very clear night with hardly any cloud in the sky. I took several pictures of the moon, and when I reviewed the pictures I'd taken, I reminded myself to get that remote shutter release. I had to shift the tripod with almost every shot, because the moon was not stationary though it would appear so with our naked eye. With every move of the tripod there is some movement and I very seldom wait till everything is quite still before I press on the shutter! Thank goodness for that sharpen tool in the photo editor! It helps to make the picture look a lot better! Not to mention that color curve tool! "I counted 16 morning glories, mommy!" cried Duncan yesterday morning before we climbed into the car to go to school. 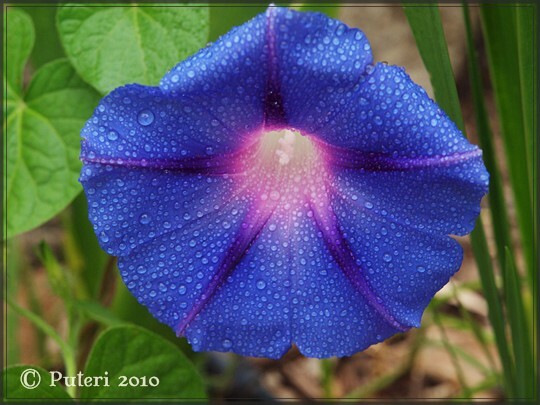 Yes, the morning glories are coming back this year. Last year, Doug pulled most of them out because he didn't like to see them wrapped around the other plants. He only left those climbing on the fence. "They're weeds," he said. We will be spending most of the summer in Malaysia, and I guess when we are gone, Doug will start pulling out the plants, like he would weeds. They are actually quite a hassle when the summer is over. You have to pull out the dried and dead vines off whatever they had clung to. But I do enjoy looking at the flowers when they are in bloom, and I especially love photographing them! The day before I told Doug to stop by the supermarket to get one avocado, one mango and some strawberries. I was going to use the fruit salad over the broiled salmon I was preparing for dinner that evening. The idea came from a Cooking Light magazine that I got last Sunday when I was shopping at Costco. 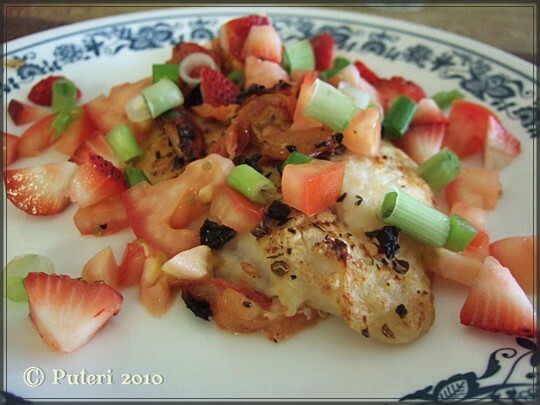 Last night, I broiled a catfish fillet and used chopped strawberries, spring onion and a tomato over it as well. I enjoyed the salmon with the fruit salad topping, and why not do the same with the broiled catfish fillet? Except this time without the mango and avocado. 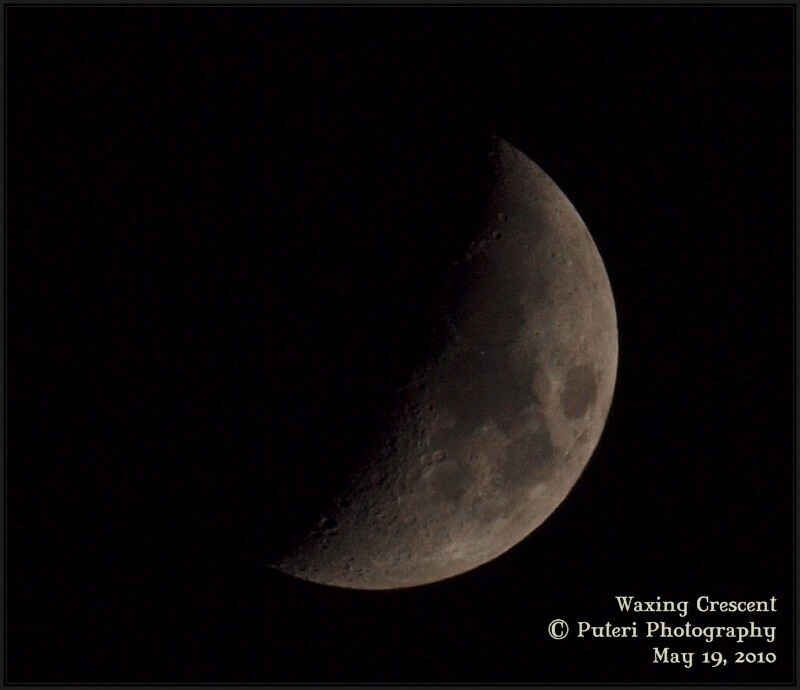 This is the waxing crescent moon taken tonight, May 19, 2010. The moon is fast becoming one of my favorite subjects to photograph ever since the first successful moon shot! I would have taken more pictures except the clouds started getting in the way, and the last few shots of the moon were totally useless. The moon was totally invisible in my pictures. Maybe I should have increased the ISO? I usually take several shots of whatever I am photographing because the object I am photographing is either moving, or my hands are not that steady. Say, I take 10 shots, at least 2 or 3 are good enough! I need back up! Or else, I will be kicking myself for not taking more because whatever I have are not that sharp. *Click the picture to see a bigger picture of the moon. Or right click, View Image. 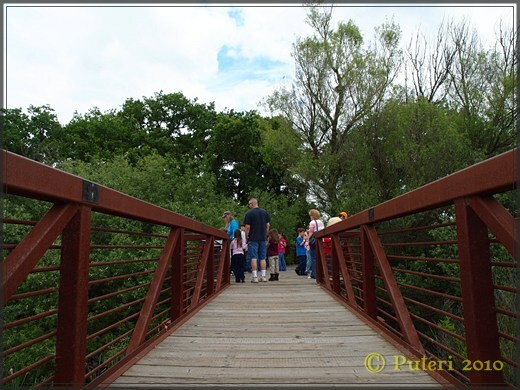 Today, a few parents and I accompanied our kids on a school field trip to Consumnes River Preserve. I was surprised that several of the parents, and the two teachers had never been to the preserve! The last time I was there was in the fall and the wetlands were filled with water and there were lots of water fowl and migrating birds. Today the wetlands are pretty dried out. The birds that live in the wetland vegetation were still there, but there were very few water fowls. It was not easy to keep a big group of K-3rd grade kids together! The fact that we had to walk along the concrete path and the walkway helped to keep the group together. I was busy taking pictures of the wild flowers and whatever caught my eye, and had to catch up with the group. I was surprised that the teachers did not make more stops along the way and point out things of interest to the kids. The one thing I noticed that really excited the kids were the bird nests. They seemed to notice the bird nests, on the ground, in the trees or between the reeds. 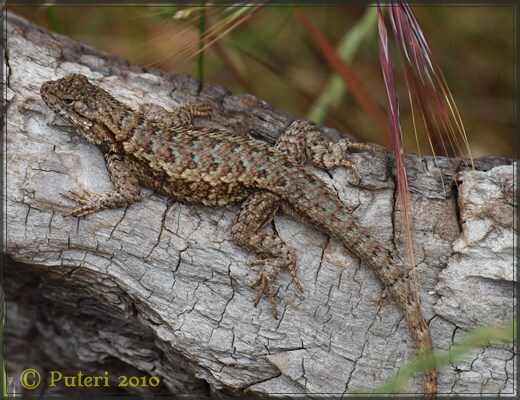 This lizard really caught my eye. I was intrigued by the turquoise coloring on its body. One of the girls wanted to pick it up, and of course, we stopped her. This was about the only water fowl I noticed in what little water that was left in the wetlands. I was fascinated by the long, curving beak. 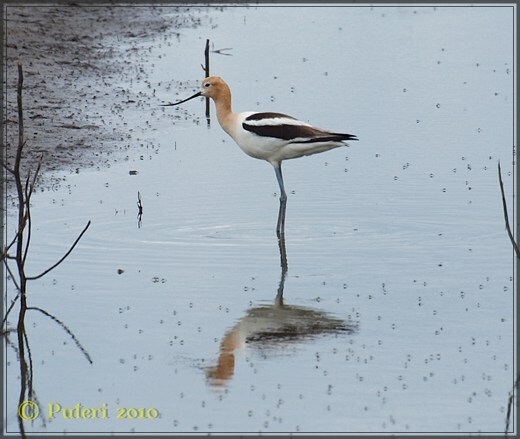 And the long legs so it could wade in the water and feed on whatever was in the water. The first grade teacher wished she had been better prepared for the trip. It was mainly organized by the second and third grade teacher, and the first graders decided to tag along. The preserve has a website dedicated to it and there is much information about the vegetation and wild life there. 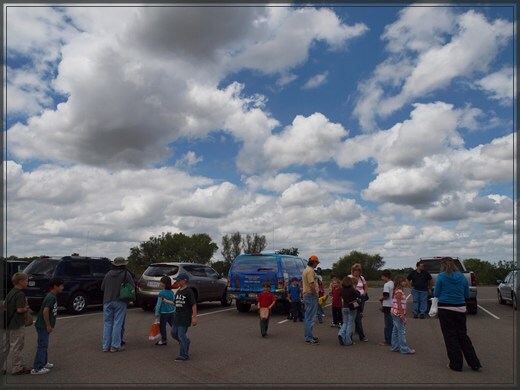 I think the kids should make another visit to the nature preserve in the future. 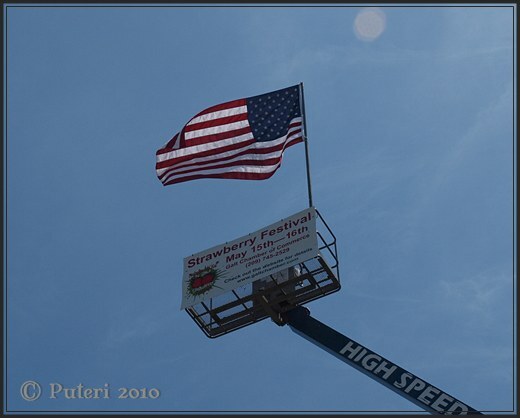 This weekend our little town of Galt holds its annual Strawberry Festival. I was surprised by the size of the crowd around noon when I got there today. I think the weather helped a lot. It is not as hot as the previous years'. 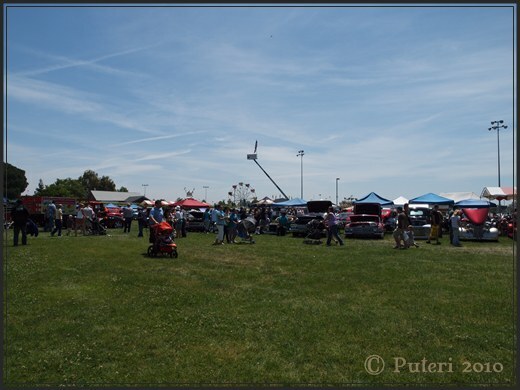 I enjoyed the motorcycles and the classic cars on exhibition. Of course I took a lot of pictures! There were also rides, and Duncan went on a few. Denice stayed on terra firma. She is just too afraid to go on any of these rides. There were all kinds of foods. 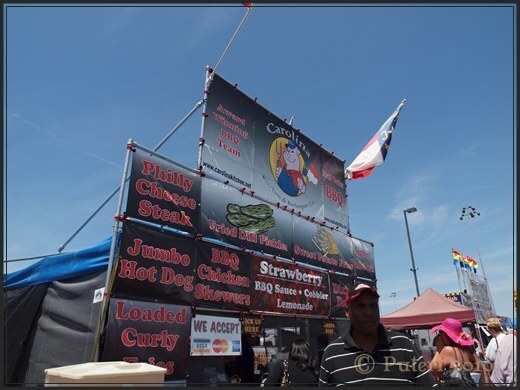 I had a rather heavy breakfast and wasn't ready for any kind of food at the festival. The kids had corn dogs, and about the only thing related to strawberry that I had, was a cup of ice cream called strawberry blonde. Yum! I only stayed at the festival a little over an hour. I had to go the library because I had signed up for a photography workshop. The library was just next to where the festival was held and I told Doug to pick me up from the library when I was done there. 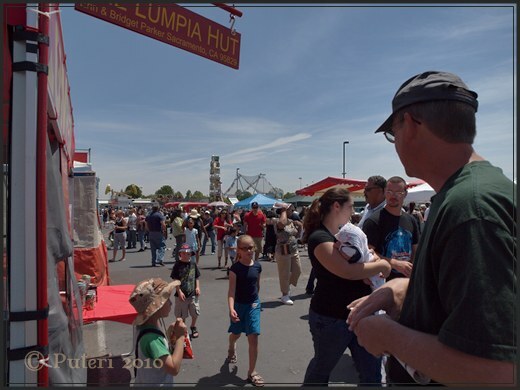 Before I left the festival grounds, I told Doug to get me some tri tip barbecue from one of the food vendors at the strawberry festival because by the time I was done at the library I knew I was ready for some food! This is one of my favorite pictures from last weekend's desert camping trip. It really shows the Mojave Desert landscape and how there's hardly anybody else there except us. I showed the picture to couple of friends and one of them, who had recently been to Utah, said the desert scene in the picture looked like what they drove through in Utah and Nevada. They were concerned that our camp site was quite a ways away from the main road - concerned for our safety and security. I told them both, we never left the camp site. And we were well armed! One of the activities during the camping was target shooting. Yes, we were pretty well armed! Well, since that trip, we are seriously looking into the possibility of getting a used trailer, something that has a shower and a toilet! It'll be nice to have at least one shower during the whole trip! The kids had a good time, so we thought, we should go out camping more often. I finally got my reverse macro outfit going. I ordered some filter ring adapters but unfortunately I didn't pay attention to which thread, whether it is the male or female that is supposed to go to the camera body adapter and which thread goes to the lens. I ended up having to order a second time to get the right adapter with the right threads to fit the correct side of the lens and the camera body adapter. I tried the reverse macro lens using a 50mm Olympus lens and it is hard to get anything in focus because of the rather shallow depth of field! The fact that it was a little breezy outside as I tried to photograph the flowers and the insects didn't help matters either! 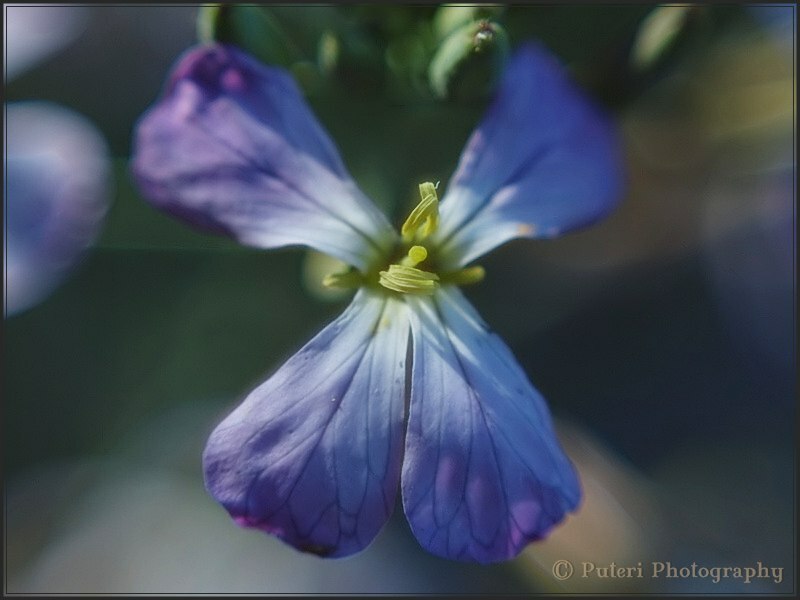 This is a weed flower. The detail on the stamens could be better, but it was one of my first few attempts on the reverse macro lens! 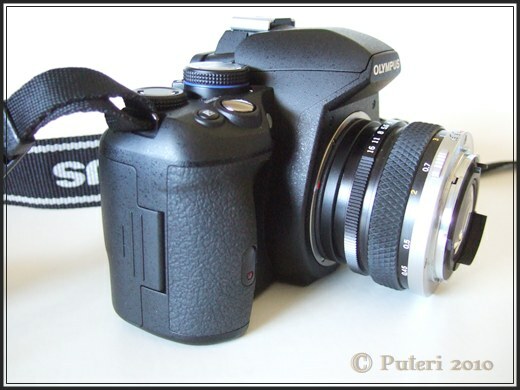 I will try with another lens, and see if it is going to be as difficult to focus. The 50mm Olympus manual lens takes very sharp pictures and produces beautifully smooth bokeh, but only if you focus it right! I cannot believe that that there are now three left in the American Idol competition. I had predicted last week that Mike Lynch would be the one to leave this week and I was right. He was supposed to have left a few weeks back but was kept by a Save from the judges. I was sorry to see Aaron leave before Mike, though. Anyway, next week is not going to be a happy time for me. It will either be Lee or Casey who will be eliminated, but my guess is, it will be Casey. He was in the bottom three at least three times, and my prediction is Lee and Crystal will make it to the finale. Unless, there is a big upset and Crystal gets eliminated next week, but that seems highly unlikely. Except for a couple of "bad" weeks, she has consistently been the front runner. But whatever, because of the clash in the TV schedule with Dancing with the Stars, I have not been able to fully focus on American Idol. I am equally fond of DWTS, and when you have to flip between the two shows .... the judges comments get skipped! I wished I had access to the East Coast's TV programming so I can watch one program on East Coast's time and the other on West Coast time! Below,Casey's duet with Big Mike. Love Casey's guitar playing! Yesterday, one of our friends who spent this past weekend camping in the desert with us, spent the night at our home on his way back to Seattle, Washington. Since we had a guest coming, I decided I'd better vacuum the floor and tidy the house up a bit. I started picking up some of the stuff the kids had left lying on the floor, got Doug to replace the vacuum bag in the vacuum cleaner, and even started vacuuming a bit. I don't remember what it was that made me stop what I was doing and look out the sliding door. Oh yes, earlier I had seen several birds perching on the fence in the backyard, and one of them had bright red feathers on its head. 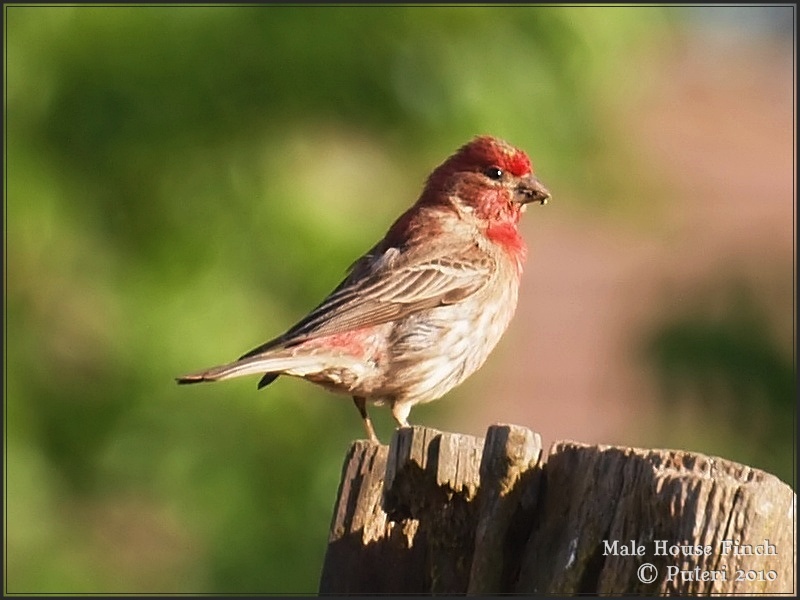 That must be a male house finch, I thought to myself! So in the midst of the vacuuming, I took a break to see if the birds were still hanging around the fence. Indeed I saw, the house finch. I left the vacuum cleaner right in the middle of the living room floor, took out my camera, change the lens, picked up my boots, and out the door I went. I had to wait several minutes before the house finch came back on the fence. I took several pictures but unfortunately, they were not as sharp as I'd like. Then the melodious singing of a bird perched on the far end of the fence, attracted my attention. I crouched and bent and made my way to the far end of the backyard. 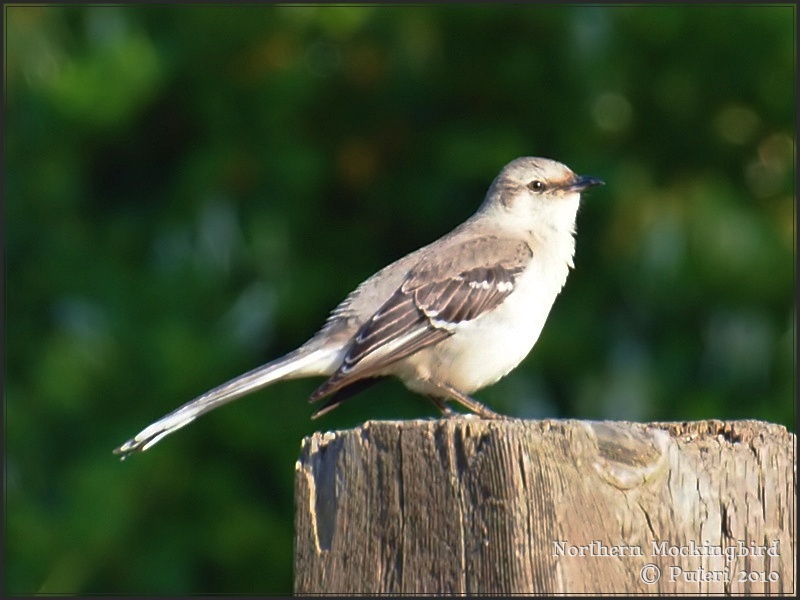 I could identify the bird as a mockingbird. It was whistling away and ignored me as I approached it. Such beautiful singing! The friend arrived earlier than expected, in fact while I was still out in the backyard, and the living room was only partially cleaned! Photographing birds is quite an addicting past time! It can distract you from your house cleaning! 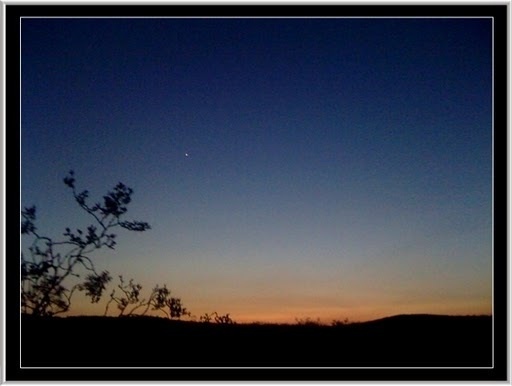 What one way can you photograph an evening desert sky after the sun has set? With a bit of branch silhouette in the foreground of course! I woke up very early this morning and went out of the van (no, I did not sleep in the tent) to watch and photograph the sunrise. This picture was taken with my iPhone camera so I could at least ediit it with an iPhone photo app and upload it to this blog. The quality of the picture is not as good as those taken with my dSLR. It's very dry in the desert and I had a nose bleed early this morning. I couldn't go back to sleep. So what better way to spend the time than watch the sun rise? We are on our way to Mojave Desert for a long weekend camping trip. In order to be able to do that we had to take the kids out of school. We also had to leave our cat at a pet boarding place. Poor kitty. It'll be another couple of hours before we get to the desert. It's a warm, dry day but not unbearably so. It gets cool at night. 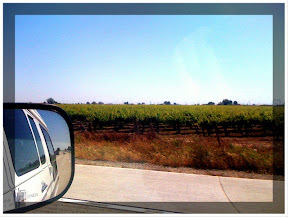 Along Highway 99, is the California Central Valley, the bread basket of California and the country. I don't know if there'll be any cell service at the desert so pictures and blog updates of the camping trip from the desert is dependent on the cell service. That's Denice having to face the wall for five minutes yesterday during lunch break. Facing the wall for a period of five minutes to thirty minutes (depending on age and degree of infraction) is something that most students at my kids' school have to deal with at one time or another. I was quite worried about this form of punishment when I first enrolled my kids at their current school. I was worried, especially for Duncan, because I wasn't sure he was able to keep still for five minutes. Well, I guess both Denice and Duncan have learned to deal with it, because, in Duncan's case, its an almost daily occurrence! And yes, this is Duncan facing the wall for five minutes during lunch break today. Well at least it's ONLY five minutes this time. 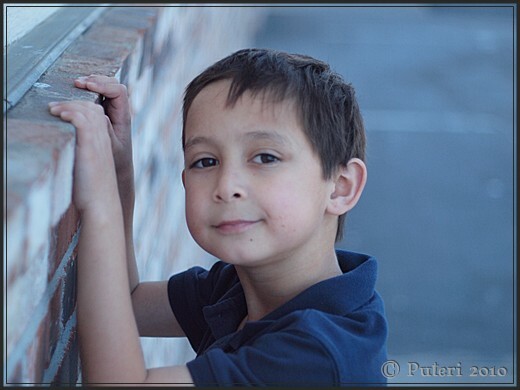 Last week, he had to face the wall, all of recess! Tomorrow he has the wall to look forward to as well. This time it will be the whole of recess. His class teacher approached me today as I picked him and Denice up from school. The wall is for "disrespecting" a classmate's mother who took them out for their short break before class was dismissed. He did not do as he was told, and went ahead doing exactly what he was told not to do. When he got home, all TV viewing priviledges were also withdrawn. Disrespect is a major offence and punishment must befit the "crime". My cat, Nikki, usually spends the day outside. Doug is quite allergic to cats, but sometimes the kids and I let the cat into the house, for a while, especially when Doug is not around. I let her in this morning so she could have a drink and eat her cat food. She was quite frisky, running and hopping about chasing I don't know what. After she got tired of chasing her tail around she jumped on the sofa and promptly fell asleep. 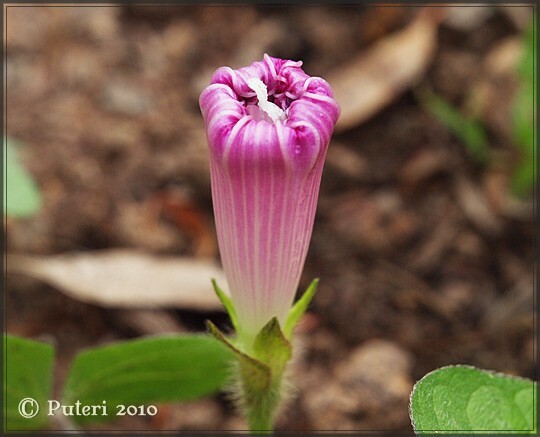 I took this picture using an old Olympus manual 50mm F1.8 lens using aperture priority on my dSLR. 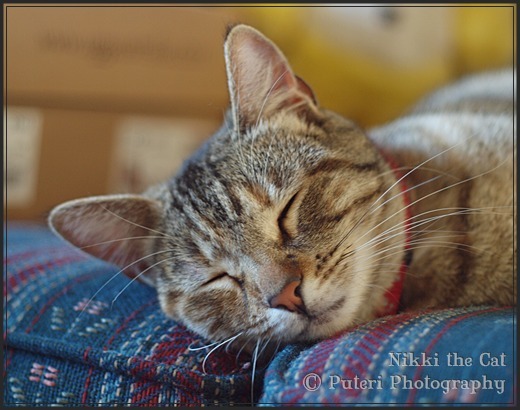 I saw some pictures by users of the 50mm Canon lenses at Amazon and liked the pictures of the pets they'd taken. Since the cat was already stealing a nap on the sofa, I took out my camera, replaced the lens and took a few pictures of her. I like the output of the 50mm lens.